If you have given any consideration to the pursuit of a career in accounting, an important question has probably crossed your mind: “What is the difference between an internal and an external auditor?” By reading the information found below, you can obtain an answer to this question. If you are attempting to grasp the difference between an internal and external auditor, it helps to first gain a basic definition of each job position. An internal auditor is an employee of a company who offers objective, independent evaluations of the company’s financial activities as well as its corporate governance and business endeavors. Additionally, internal auditors offer employers evaluations of operation efficiencies and will typically report to high-level management regarding what modifications should be made in order to ensure that the company functions optimally. An external auditor is an individual who performs audits in compliance with outlined rules and regulations regarding the financial statements of government entities, companies, or any other legal organization or entity. The individuals who use the entities’ financial data (such as the general public, government agencies, and investors) are dependent upon the external auditor for an independent, unbiased report. In considering the definitions for internal and external auditors provided above, the primary difference between the two becomes plain. 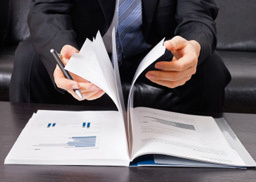 While the internal auditor is hired by a company to work on its behalf, the external auditor is not affiliated with the company being subjected to the audit and is primarily working to provide the public with information regarding the validity of the financial activity that an entity has exacted. Preparing and presenting management reports regarding audit findings. This could include data regarding control deficiencies or misstated financial information. It could also include recommendations regarding how to improve upon or entirely eliminate these shortcomings. If you are interested in pursuing a career in the field of accounting, you should know that auditing may be the right vocational path for you. Now that you know what the difference is between an internal and an external auditor, you can make an informed decision regarding which sector you would prefer to work within.